Since spring, I’ve had a crush on Cherry Grove. This sustainable farm in Lawrenceville, NJ, produces some of the area’s most interesting raw-milk cheeses, and Toma Primavera—a rustic washed rind with an exterior that looks like a flower pot—tops my list as a picnic staple. One glance at Toma Primavera and you can tell it’s made from grass-fed cows. It’s got a sunset hue, golden and creamy, and a milky smell—the first bite yields bright, tangy notes that turn warm and nutty. This is an earthy cheese with a velvety mouthfeel, a good match for hearty bread, grainy mustard and a malty beer or a medium-bodied red. Try a Beaujolais or Grenache. Cheesemaker Kelly Harding uses a recipe from the Piedmont section of the Italian Alps to craft Toma Primavera. After 60 days in the aging cave, it’s ready to be eaten. Harding also makes a superb stinker, Maidenhead, which is washed in Flying Fish beer, and a salty blue, Shippetauken. 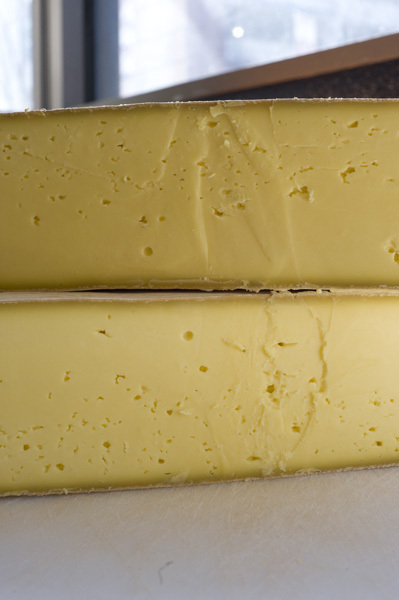 In Philadelphia, you can find Cherry Grove cheese at the Rittenhouse Farmers’ Market on Saturdays, and at Reading Terminal’s Fair Food Farmstand. If you’re up for adventure, drive to Lawrenceville and visit Cherry Grove, where you can buy cheese—as well as grass-fed meats—directly from the farm. At 4 p.m., you can even get in on the milking.